Combine the shallots, half the peanuts, garlic, sugar, half the chilli, thinned tamarind concentrate, fish sauce and lime juice in a mini chopper and blend until smooth. Adjust the balance of flavours and consistency to your liking. Cook the rice noodles according to packet directions and drain well. Toss the noodles with the dressing, carrots and mange tout. Arrange a few lettuce leaves on individual serving plates. 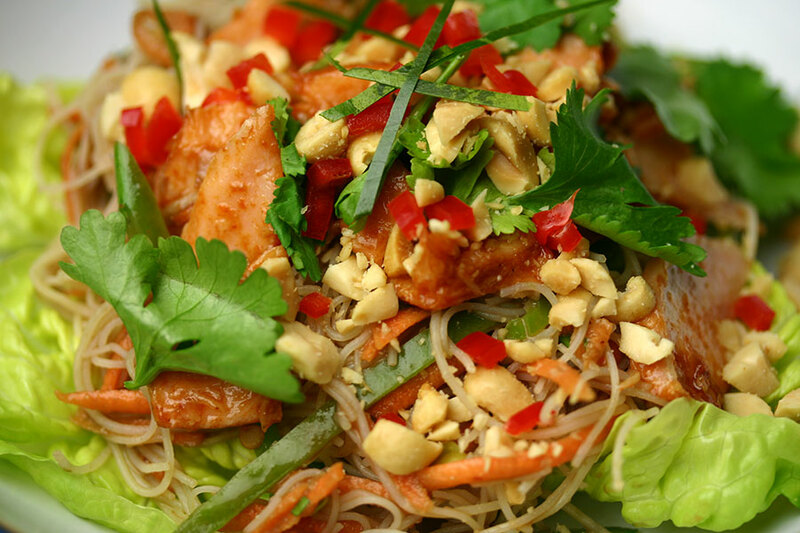 Place a mound of noodles on top, then arrange pieces of salmon, coriander leaves, a few salmon eggs, additional chopped chilli and peanuts and kaffir lime leaf.